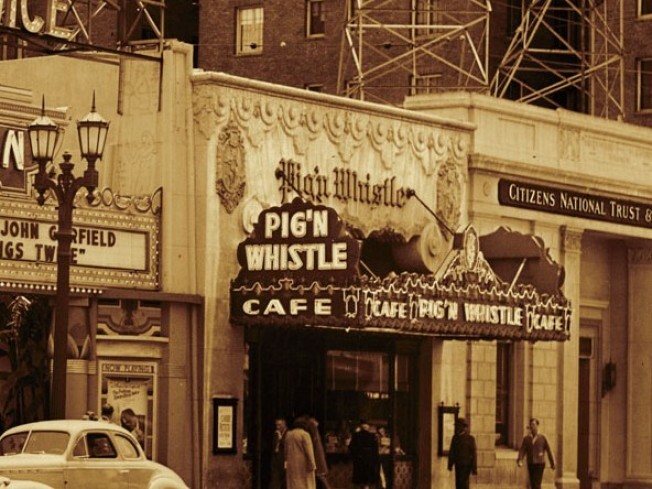 Sow Many Memories: "Pig 'N Whistle"
A new book looks at a fabled Tinseltown hang. Learn more about the Pig 'N Whistle in a new book from Arcadia Publishing. There are certain restaurants and clubs, past and present, that just summon the spirit of the city where they were, or still are, located. Maxim's in Paris or the Stork Club in New York are two examples, but our own hometown has several spots that qualify. Musso's is up there, yes, but a pop down the way is the Pig 'N Whistle, a restaurant that has shown a kind spotlight on swines, wind instruments and abbreviated forms of "and" for over a century. A new book from Arcadia Publishing looks back at the fabled restaurants -- the one on Hollywood Boulevard is not the only Pigly place to have existed -- and the impact the "Whistle" stops had and still have on the eating industry. There was a P'NW in the Alexandria Hotel downtown in 1911, as well as a few in San Francisco, too, and Pasadena, and Oakland, and and and. In short, a whole posse of Pigs ruled the age. We especially miss the menus that could double as pig masks. Is dinner more fun if you're eating it through a paper snout? There's only one answer to that. There are other long-gone charms and dishes covered in the book as well. Buttercrust Chicken Pie, please make a well-deserved comeback soon. Arcadia will be posting info about the book on its site soon, but for now you can get a jump on ordering by calling 888-313-2665. Have a Hollywood history buff you need to buy for this season? If you don't, you should definitely find one. They're good to have around.